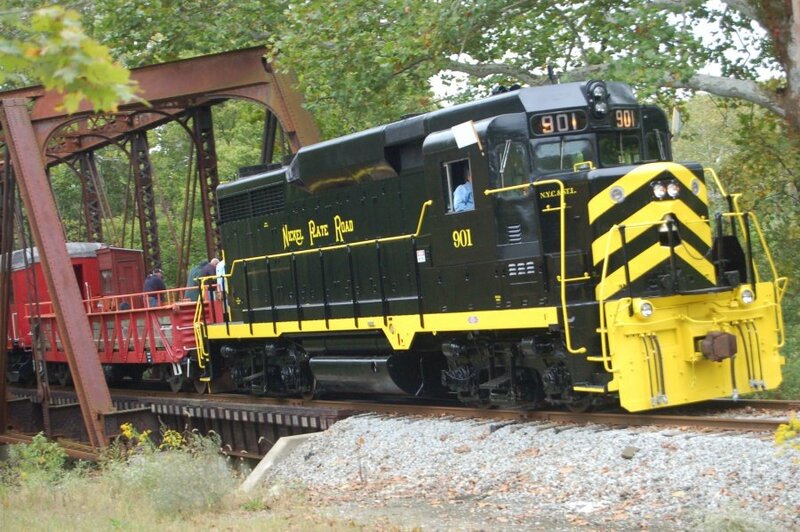 Occasionally we will opt to use locomotive #901 which is usually in service on the scenic LM&M Railroad in Lebanon, Ohio. This sister GP-30 locomotive to the #902 was one of ten locomotives built for the New York Chicago & St. Louis Railway, more commonly known as the “Nickel Plate Road.” This railroad ran from Buffalo west toward St. Louis and Chicago with lines throughout Ohio, Indiana, Illinois and, of course, western New York. The locomotive was delivered to the NKP in November of 1962 and operated as unit #901 until their merger with the Norfolk & Western on October 16th, 1964. At that time the engine was renumbered in the N&W Engine series as #2901. In the late 1980’s, it was retired by the Norfolk Southern and sold to the Indiana & Ohio Short Line Railroad, and painted in their red, white and orange colors. It was renumbered as engine #85 as it operated throughout Southern Ohio. In 1995, the unit was sold to the Cincinnati Railway Company and moved to Lebanon, Ohio. In early 2005 the unit was moved to the home rail yard of the Cincinnati Railway in Norwood, Ohio for use in tendering Amtrak compliant private cars “Moonlight Dome”, ”Birch Grove” and “Oliver Hazard Perry” from Norwood to Cincinnati Union Terminal for attachment to Amtrak. In 2009 the unit was painted in original Nickel Plate Road colors and reassigned its original number of #901. Also in 2009 it was put into service pulling the newly founded Cincinnati Dinner Train. Ownership of #901 remains with the Cincinnati Railway Company. Locomotives #901 and #902 are the only two of the original ten produced, to still be in running condition.